The Crye Multicam Bulle US MOLLE Low Drag double M4 and AK mag pouch is a reduced profile mag pouch which will take one M4 or AK mag in each of the pockets. Will also hold one G36 magazine per pocket. Elastic retention system keeps the contents secure even if the velcro flap is not deployed. 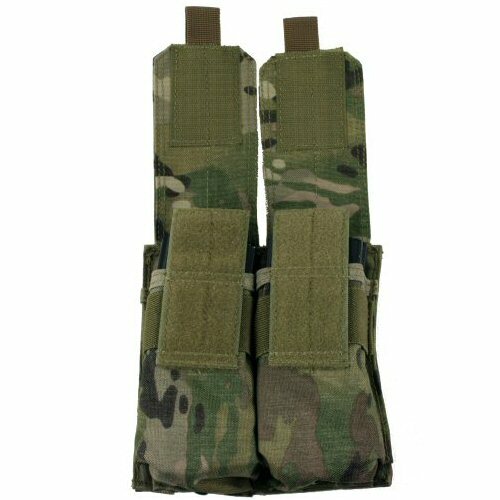 The mag pouch helps to reduce overall body profile on body armour vests and drop leg platforms and helps to keep the user mobile by reducing drag and snagging on narrow doorways, tight corners and inside confined spaces. 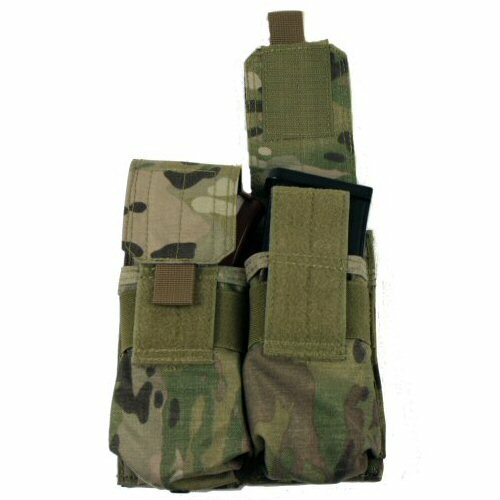 The Bulle MOLLE low drag double M4 and AK mag pouch is ideal for vehicle mounted operators who may not have to carry as high a load as foot operators, but have to work and manoeuvre within a tight space. Approximate pocket dimensions on the pouch are 17.5x7x3.5cm per pocket and the entire pouch mounting surface measures 19x16cm. 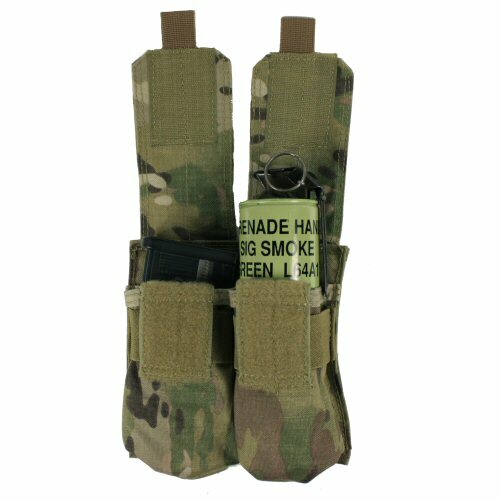 The pouch is retained on the carrying base via two button down MOLLE webbing straps which can be interwoven between the base and the pouch for added stability and security. Made of genuine Crye Multicam 1000 Denier texturised Cordura which is double stitched for durability. Please note that the price is for ONE pouch only. 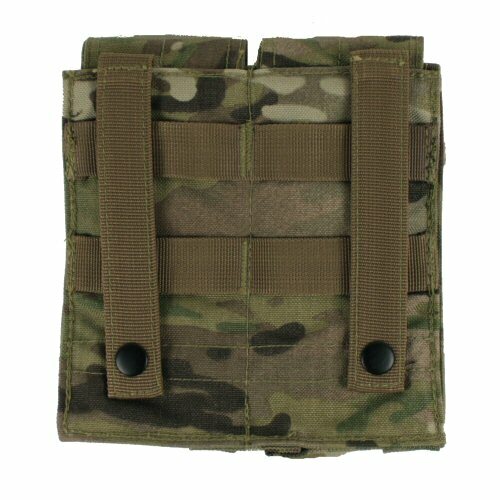 Pouch with four M4 mags inside. 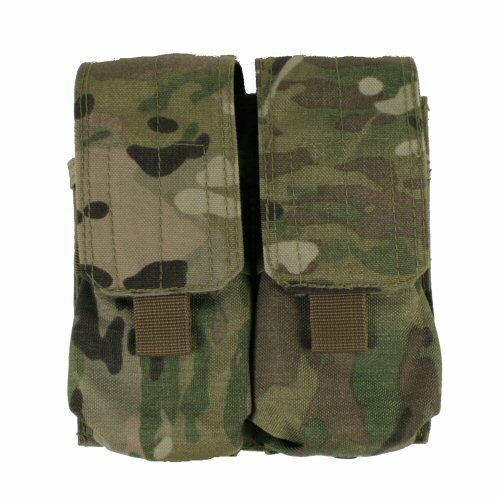 View of pouch showing the MOLLE webbing on rear.